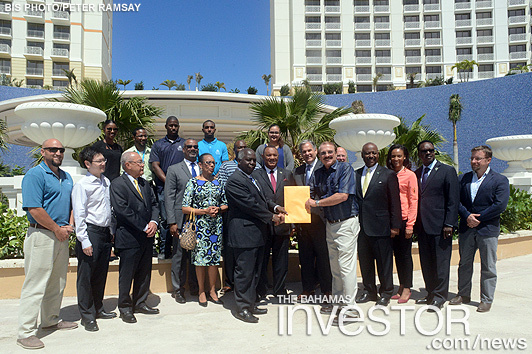 Prime Minister and Minister of Finance Perry Christie has handed over of the Certificate of Occupancy for Baha Mar resort to Chow Tai Fook Enterprises Ltd (CTF) one month before the official soft opening. Speaking at the 21 March, 2017, event, Christie said that the handing over marked “an important day of progress” for Baha Mar and The Bahamas. “Today Baha Mar is being transferred to a world-class company, one that successfully manages prestigious hotels across the world, including three successful resorts in the Caribbean – one in Antigua, one in Barbuda and one in the US Virgin Islands,” Prime Minister Christie said. Prime Minister Christie added that the new owner had actually increased capital, marketing and pre-opening investment from $200 million to $250 million. “We are grateful for such a strong level of experience and investment to usher in new opportunities for the Bahamian people,” he said. Prime Minister Christie said that he had been advised that 650 Bahamians have already been hired by Baha Mar, and 1,500 employees will be hired by 21 April. He pointed out that Baha Mar will open in phases, with more job opportunities at every phase. “These new opportunities are going to bring meaningful change for a lot of Bahamian families and that’s what it’s all about. “The hope and excitement and anticipation can be seen on the faces of the people who are being employed here – these are new employees, many of them working for the first time in this kind of an environment,” he said. Watch ZNS news segment on the handover here. Elite Airways has announced plans to begin scheduled international passenger flights to Bimini during the second quarter of the year according to a leading online aviation industry data provider. Bahamian officials including Financial Services Minister Hope Strachan met with officials of the Organization for Economic Co-operation and Development in Paris, France, March 16, 2017.